The escalating war of words between Donald Trump and Kim Jong-un has fuelled concerns the region is on a dangerous trajectory to a nuclear conflict that could have calamitous global consequences. Since 1947, nuclear scientists have maintained a so-called Doomsday Clock that symbolically measures how close the world is to a man-made global cataclysm, represented by midnight. The clock now shows 2½ minutes to midnight and ticking, the closest it has been to catastrophe since the US exploded the first hydrogen bomb in 1953. But are we really on the brink of a nuclear conflict? And is there a viable strategy for avoiding war without conceding to Kim’s nuclear blackmail? There is no doubt the long-running North Korean nuclear issue has reached a dangerous tipping point and the crisis is being exacerbated by the intemperateness of the personal exchanges between Trump and Kim. Although we are used to hyperbole and invective from North Korea’s leaders, Trump’s combative style has shocked and angered friends and foes alike, raising serious questions about his capacity to astutely manage the most serious foreign policy crisis of his presidency. But nuclear Armageddon is not yet upon us. Stripped of its confrontational rhetoric, Trump’s actual strategy is straight out of the crisis management playbook. Don’t telegraph your punches; keep all options on the table, including military force; mobilise friends and allies; employ multilateral tools such as sanctions to obtain buy-in from other states; and decouple your adversary from key supporters, in this case China. It’s also more effective than detractors allow. 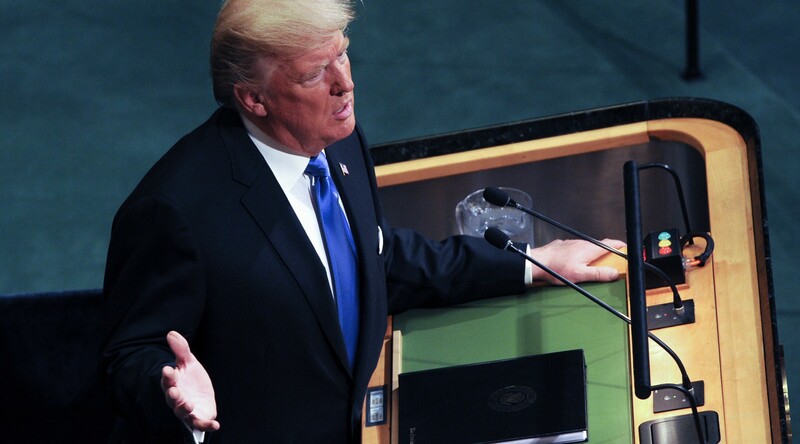 Trump has succeeded in substantially raising the cost to Kim of his nuclear weapons program, uniting allies and the international community behind the most punitive sanctions in UN history and persuading a reluctant China to get on board. These are no mean achievements given the dismal failure of any previous policy to bring Kim or his predecessors to heel. But they are unlikely to force him back to the negotiating table in the up to 18 months before his scientists complete the development of a reliable nuclear-armed intercontinental ballistic missile that can strike the US mainland or Australia. To avoid this unpalatable outcome Trump needs to double down on sanctions and ensure they are enforced by all nations. Historically, sanctions largely have been ineffective in bringing about meaningful change in the behaviour of targeted states. But this time could be different. North Korea is vulnerable to ­effective sanctions because of its economic weakness and autarkical isolation from the international trading system. They haven’t worked in the past largely because China has turned a blind eye to ­enforcement. However, Xi Jinping clearly has concluded that despite their political and economic costs, sanctions are preferable to the risk of a US military attack against North Korea, which could draw his country into a potentially disastrous military confrontation with Washington. For the first time, Beijing has begun rigorously to enforce sanctions by severely restricting cross-border trade and ­financial flows and by ordering all North Korean businesses in China to close down by year’s end. But even tougher sanctions may be needed. If Kim makes good on his threat to detonate a hydrogen bomb in the Pacific, or continues to test fly his ICBMs in the face of UN resolutions expressly forbidding him to do so, Australia should support the US in ramping up pressure on China to cut off the pipeline supplying heavy oil to North Korea. Critics argue that such an action would be counter-productive, precipitating a collapse of the North Korean economy and forcing millions of North Koreans to flee across the border into China. This is unlikely, however, because Kim would negotiate before presiding over the demise of his ­regime. The US, Japan and South Korea also should declare jointly that any future ballistic missiles launched by North Korea that fly towards the US or its allies will be shot down. The aim of this declaration would be to deter North Korea from future acts of nuclear provocation and to prevent the regime from carrying out realistic missile tests. Without further testing, Kim could not be sure that his missiles would reach us. Australian National University international law expert Don Rothwell believes Japan would have a plausible case for shooting down a North Korean missile that overflew the country under the right of self-defence provisions enshrined in international law. This would apply even if the mis­sile flew at a height greater than 60,000 feet (18,200m), which is the ceiling generally accepted as delineating the upper limit of sovereign airspace. Japan has the military capability to intercept North Korea’s missiles with the recent installation of a land-based anti-missile system to complement the seaborne variant on board its Aegis ships, a system that Australia may soon acquire. Unless Kim agrees to freeze his nuclear weapons program and accept a stringent inspection regime to ensure compliance, the US should not return to the negotiating table. After 20 years of intermittent negotiations with Pyong­yang, the only tangible outcome has been an increasingly potent North Korean nuclear arsenal and the proliferation of bomb and missile-making know-how to other aspiring nuclear weapon states. Without iron-clad assur­ances on verification, which only China can deliver, Japan and South Korea would be likelier to develop their own nuclear weapons and Kim’s nuclear blackmail will be successful. If this strategy fails then we are going to have to live with North Korea’s nukes for a while longer until new laser and directed energy anti-missile systems offer a better way of destroying Kim’s missiles on launch and in flight. Unlike former US president Ron­ald Reagan’s ill-fated 1983 Strategic Defense Initiative, this new “Son of Star Wars” technology could be deployed within a decade. Until then, sanctions on North Korea must be strengthened and maintained to persuade other would-be nuclear states that clandestinely acquiring nuclear weapons, in contravention of international norms and the nuclear non-proliferation treaty, is not worth the cost.